Includes the names: M Twain, M Twain, Marf Twan, Mark Twan, Tven Mark, Mark Tven, Marc Twain, Wark Twain, Mark Twain, Marrk Twain ... (see complete list), Mark twain's, Samuel Clemens, מרק טוין, pseud. Mark Twain, Clemens Samuel L., Samuel L. Clemens, Марк Твен, Samuel L. Clemons, Марк Твен, By (author) Mark Twain, Mark (Mark Twain) Twen, マーク・トウェン, Samual Langhorne Clemens, Samuel Langhorne Clemens, マーク トウェイン, マーク トウェーン, Марк Твен, псевд., Mark Twain (Samuel L. Clemens), MARK TWAIN [pseud. CLEMENS (S.L)]. The RECOMMENDED BY A STRANGER BOOK CLUB will discuss The Adventures of Huckleberry Finn By Mark Twain. Mark Twain, the nom de plume of Samuel Langhorne Clemens, American author, who was born on the 30th of November 1835, at Florida, Missouri. His father was a country merchant from Tennessee, who moved soon after his son's birth to Hannibal, Missouri, a little town on the Mississippi. When the boy was only twelve his father died, and thereafter he had to get his education as best he could. Of actual schooling he had little. He learned how to set type, and as a journeyman printer he wandered widely, going even as far east as New York. At seventeen he went back to the Mississippi, determined to become a pilot on a river-steamboat. But in 1861 the war broke out, and the pilot's occupation was gone. After a brief period of uncertainty the young man started West with his brother, who had been appointed lieutenant-governor of Nevada. He went to the mines for a season, and there he began to write in the local newspapers, adopting the pen name of "Mark Twain," from a call used in taking soundings on the Mississippi steamboats. He drifted in time to San Francisco, and it was a newspaper of that city which in 1867 supplied the money for him to join a party going on a chartered steamboat to the Mediterranian ports. The letters which he wrote during this voyage were gathered in 1869 into a volume, _The Innocents Abroad_, and the book immediately won a wide and enduring popularity. This popularity was of service to him when he appeared on the platform with a lecture--or rather with an apparently informal talk, rich in admirably delivered anecdote. He edited a daily newspaper in Buffalo for a few months, and in 1870 he married Miss Olivia L. Langdon, removing a year later to Hartford, where he established his home. He made a second visit to Europe and started a publishing firm in New York, himself a chief partner. But after a severe struggle the publishing house failed, leaving the author charged with its very heavy debts. After this disaster he went on a tour round the world, partly to make money by lecturing and partly to get material for another book of travels. In 1900, having paid off all the debts of his old firm, he returned to America. He had a great reception in England in 1907, when he went over to receive from Oxford the degree of Doctor of Literature. He died at Redding, Connecticut, on the 21st of April 1910. Of his four children, only one survived him. 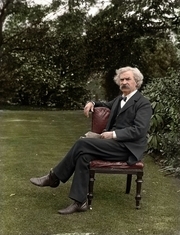 » Mark Twain's legacy profile. Mark Twain's book Adventures of Huckleberry Finn [Robotic Edition] was available from LibraryThing Member Giveaway. Mark Twain is currently considered a "single author." If one or more works are by a distinct, homonymous authors, go ahead and split the author. Mark Twain is composed of 30 names. You can examine and separate out names.